What Makes A Great Chili Recipe? This is the time of year that a nice, warm bowl of Chili really hits the spot. We’ve made Chili several times this winter and I’ve been working on my recipe. It has really made me think about what makes a great Chili recipe. I am looking out my window right now into a barren tundra of snow and ice. It is still early on in February and it seems like Spring is still a long way away. The one thing thing that I can take comfort in during this most uncomfortable time of year is the fact that this is a great time for comfort food! Sundays are usually the day when my husband and I love to experiment and make something rich, warm and comforting to enjoy on these cold winter days. Of course, one of the best dishes to make during the winter is Chili. Why Is Chili So Popular? If you think about, Chili has always been an incredibly popular dish. I honestly don’t know anyone that doesn’t like Chili. I don’t think I can say that about any other dish. Offices all around the country have Chili cook-offs and pitch-ins featuring Chili. Every restaurant has Chili on the menu. There is even a restaurant named after Chili! Why is this? I think that it is because there are so many different ways that you can make Chili. You can make it with a little heat, very spicy or a little sweet. You can make it with virtually any meat. I have a White Chicken Chili recipe that is AWESOME! Even for the worst of cooks, this is a recipe that is really hard to mess up. I can be a main dish, a side dish or an appetizer. You can put a ton of different toppings on it. I could go on and on, but I believe these are the main reasons that we all love Chili so much. What Do I Think Makes The Perfect Chili? For me, Chili is all about the consistency of it. I like my Chili very thick and full of yummy ingredients. I don’t want it too watery or too greasy. I think that one of the keys to getting your Chili the proper consistency is the use of beans. Now, I like to take credit for changing my husband’s opinion on a lot of foods. Before he met me, his taste buds were pretty conservative and he didn’t like a number of really fantastic ingredients. But, I’ve been able to talk him into trying some of these things and he loves them now. One of those ingredients is beans. He used to avoid beans at all costs. Now, he LOVES beans, especially in his Chili. You don’t want to put just any beans into your chili. Finding the right beans to put into your recipe is imperative. This is why I’ve been lucky to work with BUSH’S® Chili Beans and let you know that your search for the perfect Chili bean has ended. We all know that BUSH’S Chili Beans are famous for their baked beans. But they are so much more than that. Family owned for over 110 years, they are the largest branded bean company there is. About 33% of all cans of beans sold in the United States are BUSH’S beans. They are a fantastic ingredient to put into your Chili because they are naturally gluten and cholesterol-free. You can tell that BUSH’S cares about what is is their food and how they make it, the keep it real, honest and simple. This is the way that food should be. Now, BUSH’S has offered a product to upgrade your Chili to the next level. 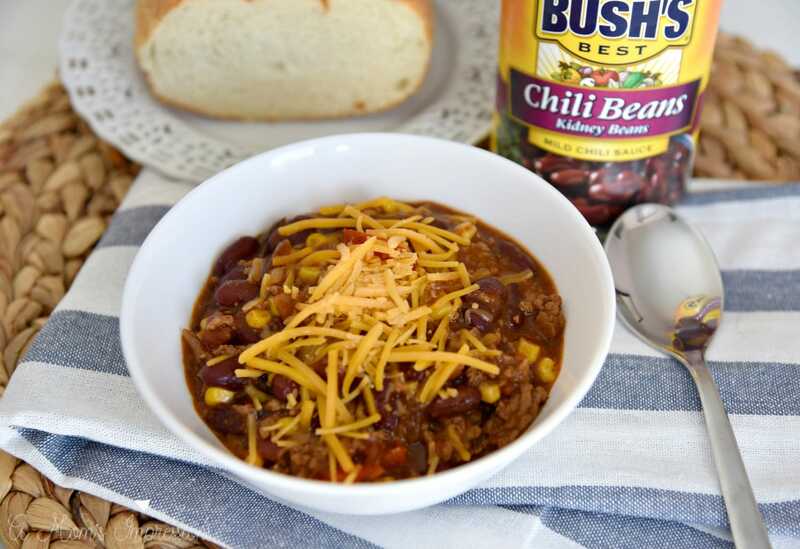 With BUSH’S® Chili Beans, you can give your Chili even more flavor because these beans are made specifically to put in your favorite Chili recipe. You can choose from pinto, kidney, black, white, red or mixed beans. The beans come simmered in BUSH’S original chili sauces that come in mild, medium or hot. The chili sauce kicks up the flavor of your creation with a blend of chilies, spices, garlic and onions. 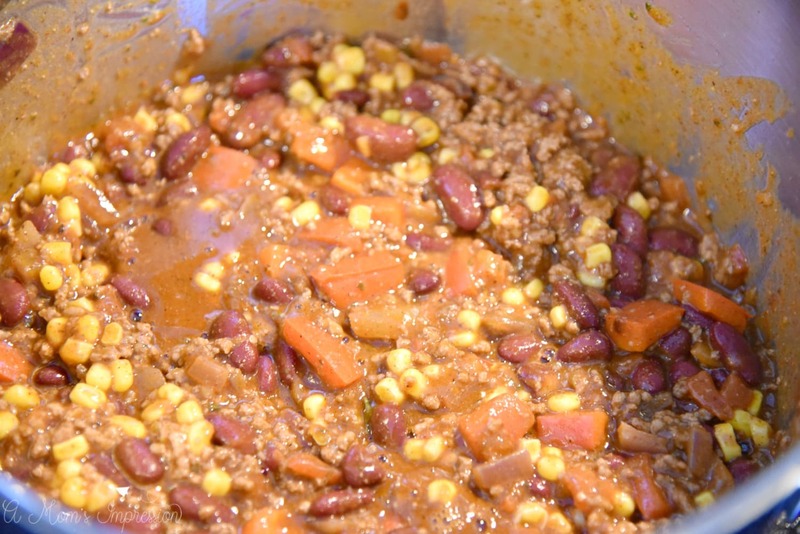 Last Sunday, we made our Chili with BUSH’S Chili beans and it turned out fantastic. We used the kidney beans and they were a perfect addition to my Chili recipe. The whole family enjoyed it while we were watching the big game. They were so easy to use. We just poured the whole can into our pot and we were ready to go! You don’t want to drain or rinse these beans! Put the whole can in there. 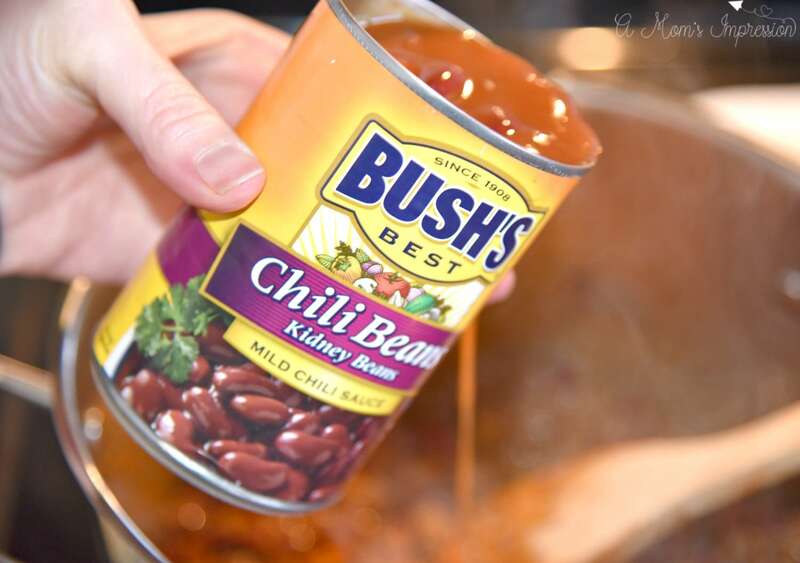 Because the beans have already been simmered in this sauce, it will give your chili that “cooked all day” taste right out of the can! We will certainly be using them again in our Chili. If we want to consistently make a great dish, we need to make sure we are putting in great ingredients. We can be sure that BUSH’S is giving us those ingredients because they have a Satisfaction Guarantee. If you are not satisfied with your BUSH’S Chili Beans, you can register to receive a coupon for a free BUSH’S Beans product of up to 16 ounces. Some restrictions may apply. Head to www.bushschilibeansguarantee.com to learn all about it. 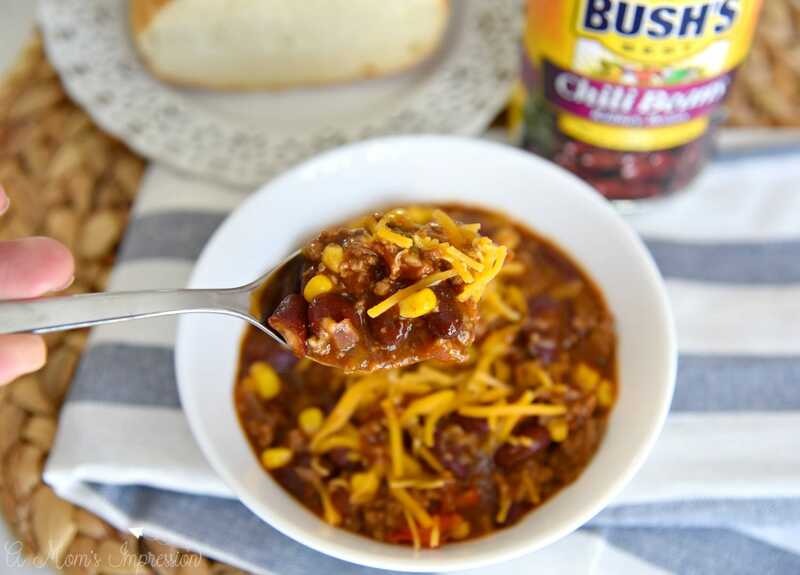 Give your Chili the kick that it needs! 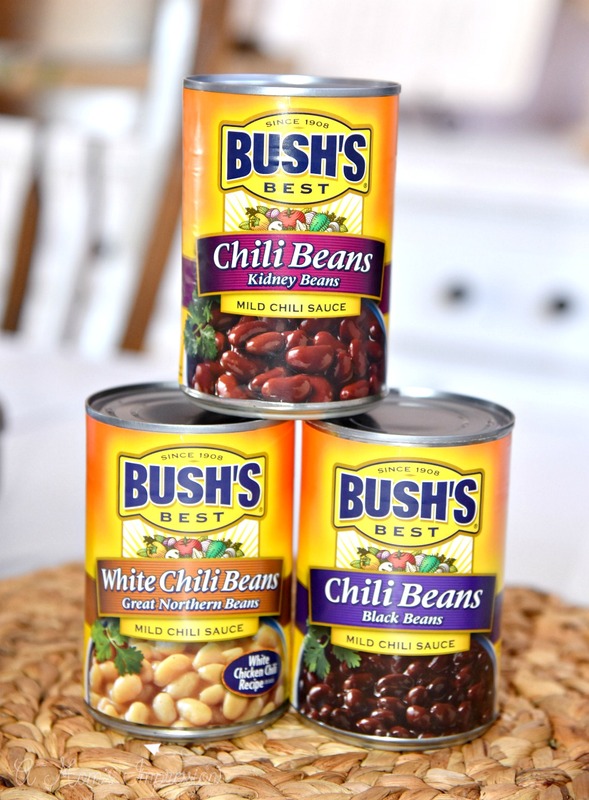 Grab some BUSH’S Chili Beans on your next trip to the grocery store. Just look for the yellow can!